EVAPTECH said it is proud to announce the release of its new “FM Approved Field Erected Cooling Tower” video which promotes its new Series ES and ESP Cooling Towers. 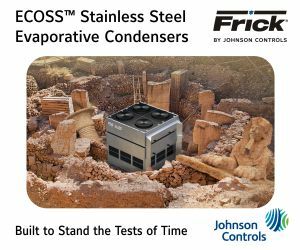 The Series ES and ESP (standard with Franklin Fill) are the first fiberglass cooling tower product lines to receive a Certificate of Compliance according to FM Approvals published Standard 4930. Innovative Refrigeration Systems was featured in the April 2014 issue of Industry Today. The article highlights the company’s beginnings as a garage shop, and follows up with a deeper look into Innovative’s services. When evaporator coil surfaces become coated with foreign particles, dust, dirt, pollen, bacteria, and mold, the ability to transfer heat is greatly reduced. Coils with a layer of dust the thickness of a dime lose up to 21 percent in efficiency. The build-up of these migrated or growing substances insulates the surfaces, which degrade the cooling capacities. Living pathogens may develop, such as salmonella or listeria that could transfer to the area food processing equipment surfaces. Dirty evaporator coils increase discharge head pressures; reduce compressor capacities, increase delivered supply air temperatures, cut the system’s refrigeration effect, and overall increase energy usage. Food processing area evaporators and HVAC unit evaporators need to be deep cleaned to reduce operating costs and avoid contamination risks. All the equipment in the area of the evaporators must be protected, checked, and cleaned after the evaporator coils deep cleaning is completed. An unfortunate issue occurred at a food plant when an overhead coil had not been visually inspected or cleaned for a period of time. IIAR Premium Content. Click here to read more. 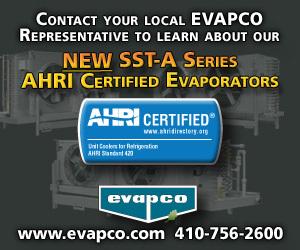 The Refrigerating Specialties Division of Parker Hannifin Corporation said it has launched its new CSRV for the industrial refrigeration market. The company said the Cartridge Safety Relief Valve will save customers time and money on maintenance costs. A new research project, re­cently implemented by the International Institute of Ammonia Refrigeration, will revisit the economic sizing methodology the industry uses to determine optimum pipe sizing. The project, expected to be com­pleted in the next year, will provide a computer tool that will allow end users to determine optimum pipe sizing based on input data that includes the initial cost of a piping system, energy cost, life expectancy and refrigeration system oper­ating efficiency. 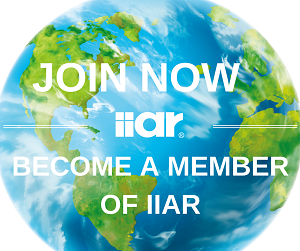 The concept of eco­nomic pipe sizing was introduced to the ammo­nia refrigeration industry in 1984 by Bill Richards, one of the founding members of IIAR. Rich­ards initially established the capital cost of piping by looking at diameter and length, and provided corrective factors for pip­ing systems with varied costs relative to a baseline value, while also making adjustments for energy costs and hours of usage. For example, a facility could use a small pipe that is cheap to install but has a high pressure drop, so operating costs are higher, or they might go to a large pipe with low pressure drops that is more expensive to install but has lower operating costs. “This computer tool will help facili­ties make the decision on how much to spend initially and what the return will be on that investment,” said Nelson. 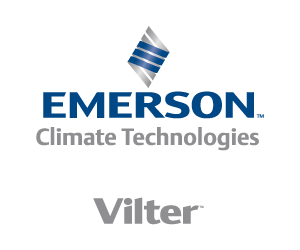 Equipment manufacturer Emerson Climate Technologies said it will dramatically expand its line of products using carbon dioxide in 2015. The five-year replacement interval for relief valves isn’t a practice that gets much scrutiny. It’s spelled out in IIAR Bulletin 110, and a provision establishing the need for a common interval appears in the Boiler and Pressure Vessel Code, making it a generally accepted “no-brainer” for much of the industrial refrigeration industry. At its core, that five-year estimate for optimal replacement of valves is just that, an estimate. And it’s an estimate that raises questions about how relief valve replacement intervals can impact optimal safety, efficiency and economics in any facility. Until recently, no real mechanism for quantifying those replacement intervals – and the potential benefits of extending or shortening them – has existed. But a new analysis tool, called SRVcalc, may prove to be a powerful way to do just that, with long reaching implications for how the industry implements generally accepted practices that have been on the books for years. SRVcalc is a tool intended to statistically analyze post-mortem relief valve test data to refine the replacement interval of relief valves for a given installation. SRVcalc is the byproduct of a research project funded by ARF and overseen by the IIAR Research Committee. The principal investigator for this project was Dr. Frederick T. Elder of Frederick T. Elder and Associates, Madison, WI. “Like all IIAR research projects, SRVcalc is intended to fill in the gaps in our knowledge base,” said Bruce Nelson, IIAR Research Committee Chair and President of Colmac Coil Manufacturing Inc.
Howden Compressors said it is proud to announce that it has received the President’s Award for Outstanding Achievement 2012 from Scottish Engineering, at its prestigious annual awards event in Glasgow. This award is in acknowledgment of Howden Compressors’ significant growth over the past two years, the company said. Kraft Foods, Northfield, Ill., announced plans to make a $100 million investment at its Springfield, Mo., cheese plant. The manufacturing facility, which recently celebrated 75 years of operation, produces Kraft cheese and Kraft dinners. © 2014 Natural Refrigerant News. All rights reserved.